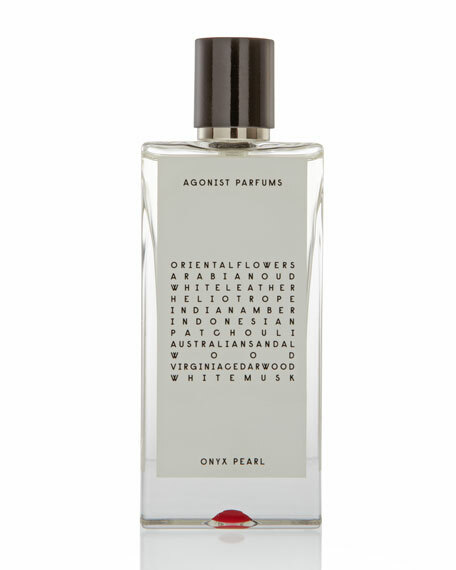 This fresh and exotic 100% natural fragranceAgonist Onyx Pearl perfume sprayis sharp and clean. The unique and skillful composition is expressed in the sculpture using the finest cutting techniques in glass and draped in gold and silver. Top: Oriental Flowers, Arabian Oud, White Leather. Heart: Heliotrope, Indian Amber, Indonesian Patchouli. Base: Australian Sandalwood, Virginia Cedarwood, Whitemusk. In handmade Swedish glass bottle, 50mL/1.69 fl.oz. Swedish perfume brand AGONIST was founded by the creative couple Christine and Niclas Lydeen in 2008. Christine has a background in fashion and studied at Studio Bercot in Paris, where shedue to her French rootslived and worked before moving back to Sweden, where she met Niclas, an Art Director and visual artist. Together they realized their dream of working artistically with fragrance. Today AGONIST is regarded as one of the most sought after and unique brands within the international niche market of perfumes. With a distinct focus on details, artistic expression, and raw material, AGONIST creates unisex fragrances in collaboration with renowned perfumersbased on natural ingredients. For in-store inquiries, use sku #229089.